Location: Approximately 11 mi N of Selawik in the NE quarter of Section 27, T16N, R7W KRM in Section 3, 4-SE 1/4, T16N, R10W Kateel River Meridian. Access: The site is accessible by winter-only ice road and small aircraft. GPS Coordinates: N66° 44’49”, W160° 08’23”. 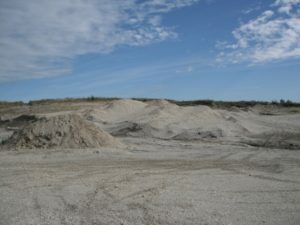 Material: The pit has been developed on what appears to be a glacial esker and contains in excess of 250,000 cubic yards of excellent quality gravel within the currently mined or stripped area. The gravel consists of coarse to cobble sized, sub-rounded to sub-angular clasts of metasedimentary rock and quartz.